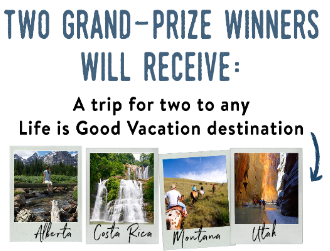 Life is Good “Go Places” Sweepstakes – Win a Life is Good vacation package & more! Win a Life is Good Vacation for 2 & more (2 winners)! ENTRY LIMIT – LIMIT ONE (1) ENTRY PER PERSON FOR THIS PROMOTION. ELIGIBILITY – The Promotion is only open to legal residents of the United States and Canada (excluding Quebec) who are 18 years of age or older at the time of entry. SWEEPSTAKES ENTRY PERIOD – Promotion begins March 19th, 2018 at 12:01 A.M. EST and ends April 22nd, 2018 at 11:59 P.M. EST. *This post may contain a referral link. Olivio’s A Family Vacation to Anywhere! 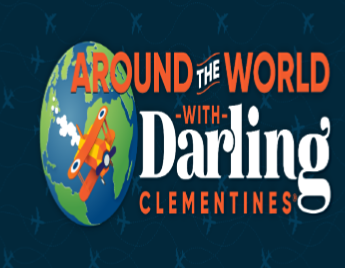 Sweepstakes – Win $10,000 for a family vacation! ENTER SWEEPSTAKES HERE – Olivio Sweepstakes page. ENTRY LIMIT – Limit of one (1) entry per person using only one (1) email address per day, up to a maximum of ten (10) entries per person or email address throughout the duration of the Sweepstakes, regardless of method of entry. ELIGIBILITY – Sweepstakes is open to legal residents of the 48 contiguous United States and the District of Columbia (excluding residents of Hawaii and Alaska) who are eighteen (18) years of age or older (or of legal age of majority in their state of residence, whichever is older) as of December 01, 2015. 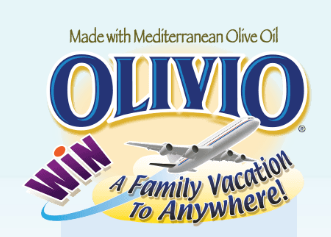 SWEEPSTAKES ENTRY PERIOD – Olivio’s A Family Vacation to Anywhere! Sweepstakes begins on December 01, 2015 at 12:00 PM Eastern Time (“ET”) and ends on July 31, 2016 at 11:59 PM ET. PRIZES – Grand Prizes (2): Winner’s will be awarded $10,000.00 towards a family vacation to anywhere (awarded in the form of a check). First Prizes (3): Luggage Sets (ARV: $500 each). 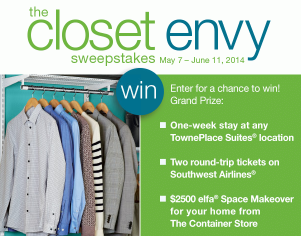 The Container Store Closet Envy Sweepstakes & IWG – Win a gift card for an elfa closet & more! Win a $2,500 gift card for an elfa Premiere Closet, a gift certificate for a 7-night stay at TownePlace Suites by Marriott and 2 round-trip tickets on Southwest Airlines! ENTER SWEEPSTAKES HERE – Container Store Sweepstakes page. ELIGIBILITY – Closet Envy Sweepstakes is open only to legal residents of the fifty (50) United States and the District of Columbia (excluding Alaska and Hawaii) who are at least eighteen (18) years old at the time of entry. SWEEPSTAKES PERIOD – The Promotion begins on May 7, 2014 at 12:00 a.m. Eastern Time (“ET”) and ends on June 11, 2014 at 11:59 p.m. ET. PRIZES – Sweepstakes Prize: ONE (1) GRAND PRIZE: A gift card good for a $2,500 elfa® Premiere Closet, a Gift Certificate good for a seven (7) night stay at TownePlace Suites® by Marriott (maximum value of $1050), and two (2) roundtrip tickets on Southwest Airlines® to be used to any Southwest Airlines® destination (maximum value of $800). Tickets are subject to Southwest Airlines terms and conditions; certain restrictions may apply. No blackout dates. Tickets are valid on Southwest-operated, published, scheduled service only in the United States and Puerto Rico. Tickets are not valid on code-share or AirTran operated service or any international service. Airline tickets awarded will expire one year from date of issue. Approximate Retail Value (“ARV”): $4350. Instant Win Game Prizes: FIVE (5) FIRST PRIZES: elfa Closet Makeovers. ARV: $500. ONE (1) SECOND PRIZE: An Eagle Creek 25″ Adventure 4-wheeled piece of luggage (black). ARV: $335. TWO (2) THIRD PRIZES: A 22″ Adventure 4-wheeled piece of luggage (blue). ARV: $295. SEVENTEEN (17) FOURTH PRIZES: $100 Gift Certificate to TownePlace Suites. ARV: $100. TWO (2) FIFTH PRIZES: a Flashpoint rolling duffel bag (black). ARV: $150. FIVE (5) SIXTH PRIZES: An Allrounder wheeled tote (hounds tooth). ARV: $99. FIVE (5) SEVENTH PRIZES: An Eagle Creek pack-it folder set. ARV: $84. FIVE (5) EIGHTH PRIZES: An Eagle Creek Pack-It Folder, an Eagle Creek shoe cube, and a digital luggage scale. ARV: $62.99. EIGHTEEN (18) NINTH PRIZES: A $50 Gift Certificate to TownePlace Suites. ARV: $50. ONE (1) TENTH PRIZE: A $50 Gift Card to The Container Store. ARV: $50. FIVE (5) ELEVENTH PRIZES: An Eagle Creek Specter Pack-it Compression set (green). ARV: $38. FIVE (5) TWELFTH PRIZES: An Eagle Creek Pack-It cube set. ARV: $26.50. FOUR (4) THIRTEENTH PRIZES: A $25 Gift Card to The Container Store. ARV: $25.